This last week and Week 2, so far I feel has been going as planned. Focusing on cardio and diet I have lost 7 lbs. I maintained a daily regimen of either a run or ab workouts. While the fat burn has allowed me to feel some basic progress of abs, I really only feel like I have a two pack. My goal would have been easier to get Tupac instead of Bruce Lee. The response from friends has been overwhelmingly positive with many notes of encouragement. Rosanna said “you can do it!” Joe started his email with, “That took guts.” Of course, there was the motivational shame, like Ryan’s comment, “you looked like a 12 year old boy” or Teddy’s, “you looked kinda pregnant.” I assure you, I am of age and not pregnant. Sigh. But I needed to hear it! Great emphasis has been put on eating right. Teddy also said, “six pack abs are all about 80% diet and 20% workout.” Gerry, Steve, and Kevin talked about the glycemic index and the importance of maintaining steady blood sugar levels and adverting spikes by eating conscientiously a diet of high protein, low carbs, and no refined sugar. Jon shared a telling piece of wisdom,”There is no such thing as a quick way to the perfect body, just like there are no real get rich quick schemes.” He reminded me that this goal may not take six weeks, but much more intense determination over time. 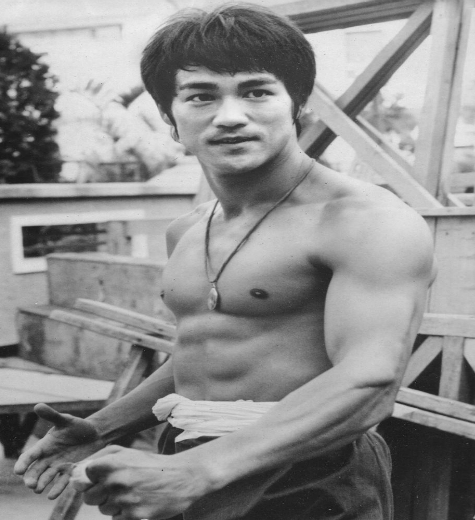 And finally, Joe again chimed in reminding me that when the going gets tough, “you have to think Bruce Lee abs!” Yes, the vision and painted picture of Bruce helps me push for those few extra painful crunches, twists, and lifts. Looking forward to Week 3 and more intense workouts. I am learning more about the abdominal muscles so I can design more workouts to work them all and integrate weights. Previous story Who Found Love on Social Media? Well, They Did.